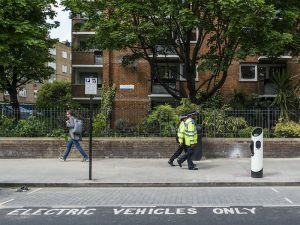 The Source London charging network is to gain 400 new charge points on EV dedicated bays by the end of this year although charges will now be levied on use of the network. BluepointLondon, which took over operation of the network from TfL in September 2014, said the new chargers are being installed under agreements with TfL and 16 London Boroughs, of which 200 are already deployed. In addition, BluepointLondon has developed an enhanced interactive map and a Source London app enabling members to locate and book charge points up to 40 minutes in advance. However, the operator also announced that from 3 October a monthly subscription fee and pay-as-you-go rates will be introduced for new members while existing Source London members be able to charge for free until 31 December. For the last two years Source London members have just paid a one-off fee of £5 and no charging costs. The new monthly membership fee will be set at £4 with a 3.6 pence per minute charge on the new charge points (minimum 20 minutes) but free for older charge points where BPL is not responsible for the maintenance. To download the Source London app click here for IOS app or here for Android. Next: A new era for electric vehicles?